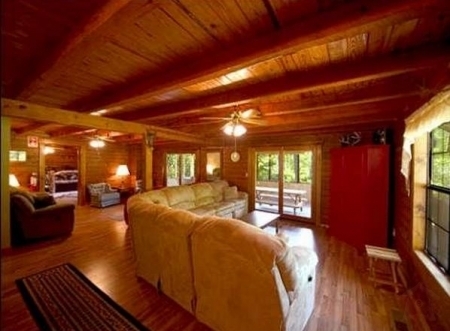 Buffalo Lodge is best known for being the perfect setting for large group gatherings with its over 5000 square feet of living space and accommodations for up to 35 people. With a huge dining area and fully-equipped kitchen, an enormous great room, a quiet library filled with hundreds of books and a giant rec room providing a pool table, there is something for everyone! While staying at Buffalo Lodge, you and your group can enjoy a cup of morning coffee while rocking to the sounds of song birds on the massive 55 foot long, 2-story covered porch. 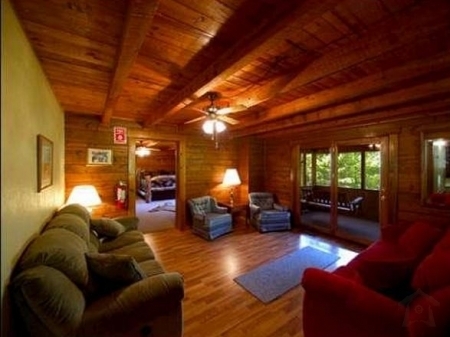 Or, you can enjoy the swing and picnic table on the screened porch. Deer, wild turkey, squirrels, chipmunks, song birds and other critters are commonly viewed right from the lodge. 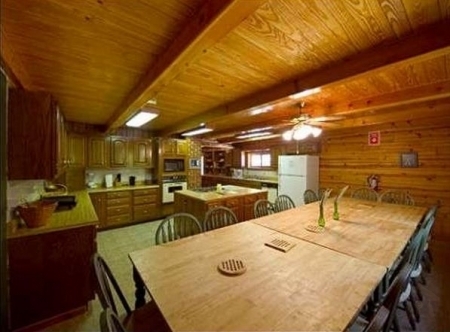 To see more photos of this cabin, go to Accommodations. Adjacent to Buffalo Lodge is your private five-star \'campsite\' that includes a large rock fire ring for those campfires and s\'mores, lots of benches for seating, four picnic tables and a few hammocks perched beneath towering pine trees. Perhaps the best part of your \'campsite\' is slipping back to a waiting warm bed just across the driveway giving you the best of both worlds! Enjoy a good, old-fashioned game of horseshoes or a late night soak in the out door hot tub after a day of hiking the Ozark Mountains or floating the Buffalo River!! The Master Suite, also known as our Honeymoon Suite, boasts with rustic elegance and is usually taken by the person or persons who put together the retreat. 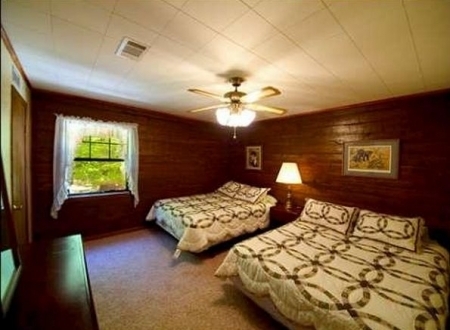 There are also 2 Guest Rooms that each have two queen-size beds. They are great for couples or to allow families to share a room with their small children. 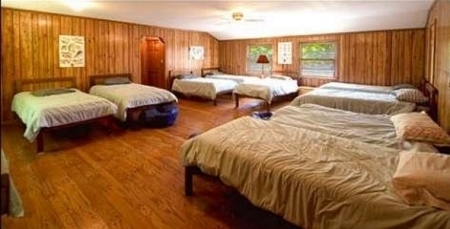 The dorm room is a large room that hosts 8 guests with 3 sets of bunk beds and 2 twins. 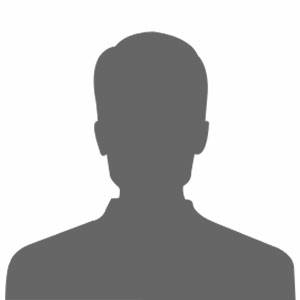 It\'s great for kids and large groups! The 2 twins can also be pushed together to make a king size bed making it accommodating for several couples to get away as well! 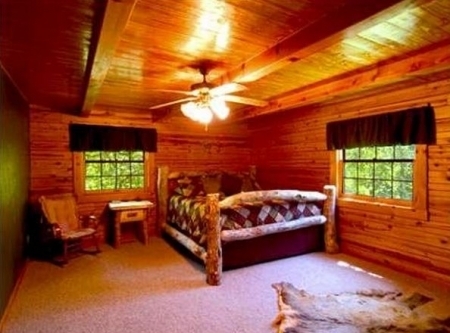 The bunkhouse is a 2-story log structure with sleeping quarters upstairs and a rec room downstairs. 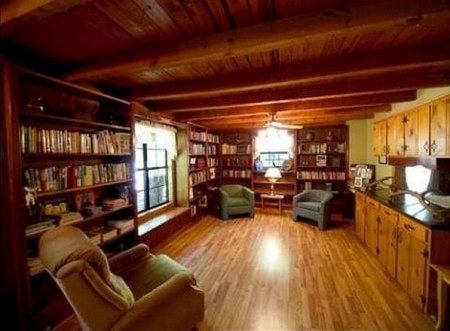 Upstairs you\'ll find 8 single beds, a futon, and a full bathroom. The bunkhouse and the lodge dorm room allow for easy separation of boys\' and girls\' sleeping quarters making it perfect for church youth group retreats! Children 5 years old and younger are always FREE! All rates are per night based on the maximum number of people during your stay and subject to 9% sales tax. There is a 2 night minimum and a minimum deposit of $300 is required to secure all reservations and is non-refundable. (If total stay is less than $300, payment must be made in full at time of making the reservation.) If cancellation is absolutely necessary and is made at least 21 days prior to scheduled arrival date, the deposit and any amount paid toward the balance will be applied to a future reservation within 12 months. Specials are not valid for stays that include a holiday. Holiday rates apply to stays that include any of the following: New Year's Eve, Memorial Day Weekend, Labor Day Weekend, Thanksgiving Day, Christmas Eve or Christmas Day. Unfortunately, we cannot allow pets in any of our cabins. All cabins are smoke-free but have outside areas on porches and decks where smoking is permitted and receptacles are provided. Thank you for your understanding.